Cystectomy is the treatment of choice for localized urothelial carcinoma of the bladder involving the smooth muscle or for superficial bladder cancer uncontrolled by conservative treatment . The mortality and morbidity is well known, especially in patients with a high American Society of Anesthesiologists (ASA) score . Laparoscopic procedure for cystectomy have been described, either totally intracorporeal or with combined procedure [3,4,5,6]. 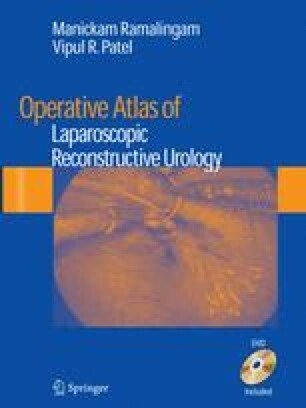 We describe in this chapter the different steps of a combined procedure for laparoscopic cystoprostatectomy with orthotopic reconstruction. With the goal of shortening the operative time, we have chosen a combined technique of a laparoscopic cystoprostatectomy and an open reconstruction of the bladder. This permits combining the advantages of laparoscopy and the rapidity of open surgery. The advantages of laparoscopy are the magnification, the decrease in pain, and the maintenance of the immune wall. It is also an almost bloodless surgery. All these factors contribute to the decrease in the morbidity of this surgery and shorten the hospital stay [5,7]. It also contributes to a decrease in the required analgesia [4,7,8].